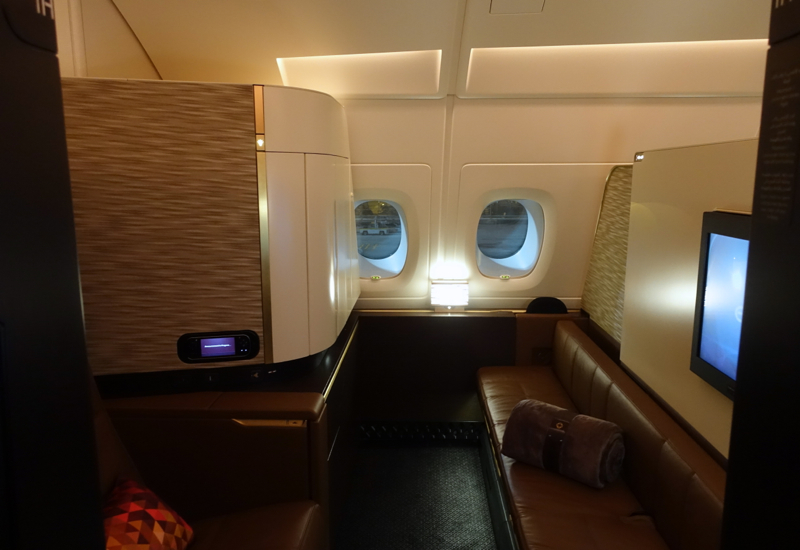 As my husband described in his Etihad A380 First Apartment Review, there are 9 closed suites / Etihad First Apartments on Etihad's A380, plus the 3 room Residence. 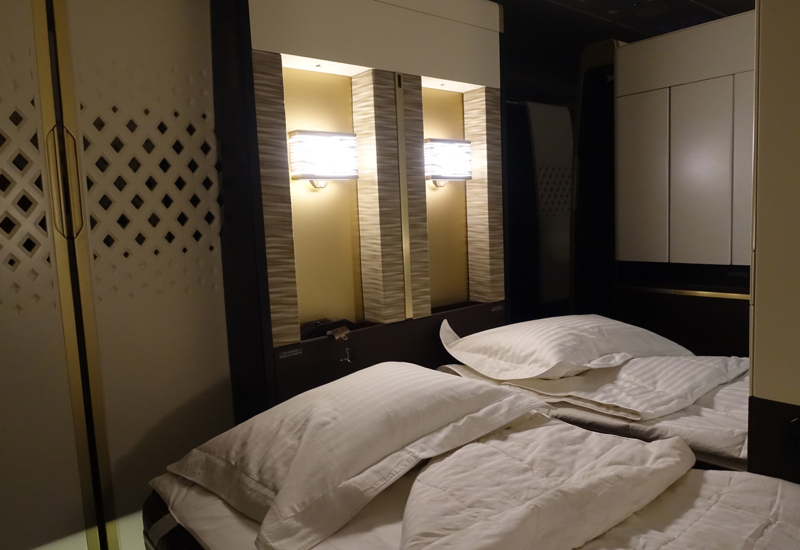 Each Etihad First Apartment is 39 square feet, which may not sound like much in the context of hotel rooms, but is actually over 70% more space than in regular Etihad First Class or most other airline first class products. 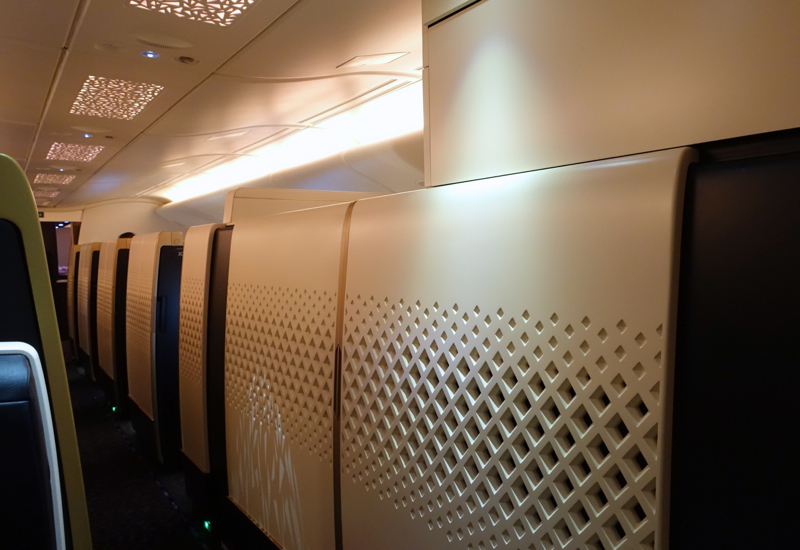 It helps that there is just one aisle, with first class apartments on either side, instead of the two aisles and 1-2-1 configuration found in Emirates First Class, Lufthansa First Class, Qatar First Class, and Thai First Class, which also offer First Class on the A380 Upper Deck. I consider seats such as 1H the least desirable, since 1H is rear facing and an aisle seat, so you can't look out the window while seated and are also close to the aisle, with potential noise disturbance from aisle traffic. 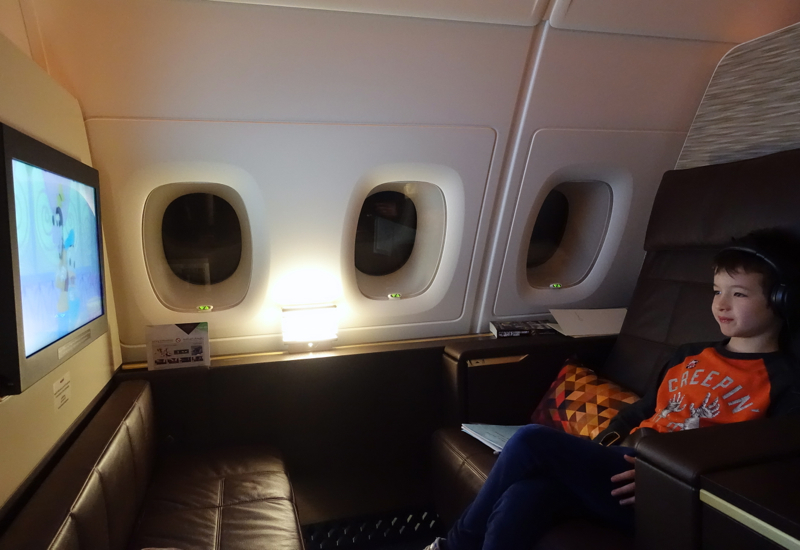 This time, my son was in 4K and I was in 3K, so we could try out the “couple's seats” which can partially interconnect by sliding back the divider halfway. The seat itself, of Potrona Frau leather, is comfortable but doesn't recline as far as first class seats that can be fully reclined into beds. So those who want a significant recline when lounging will be out of luck, and need to choose whether to stay in the seat or have the bench made into a bed and watch the TV that way. 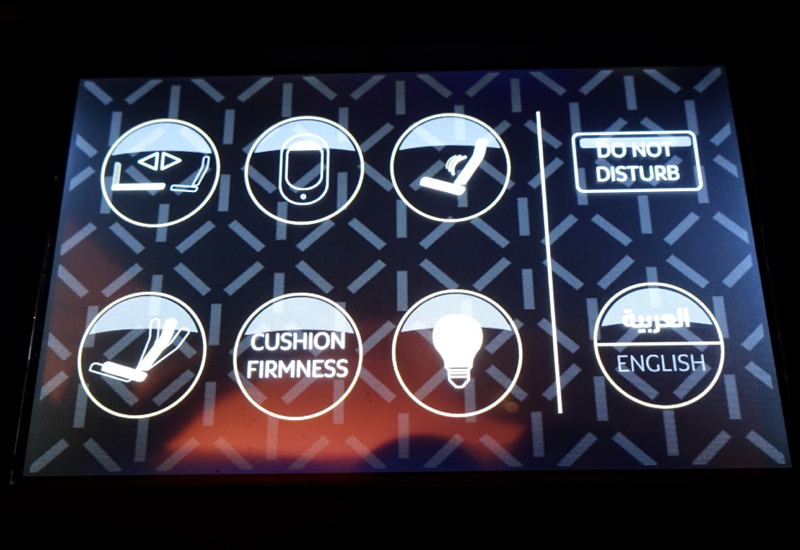 Seat controls are touch screen and intuitive, and it's possible to set a “Do Not Disturb” sign as well, although it's more for show, since really anyone standing up (except for kids of my son's height) can easily peer over the closed doors of the Apartment. The lighted vanity would seem to be most useful for women applying makeup; I'd be curious to hear how many male passengers make much use of it. Still, as I mentioned in my prior review, it is a nice luxury to have such a large well-lit mirror to yourself, without having to take up bathroom time. The amenity kit itself, with Le Labo products, is nothing to write home about, but has all the essentials: moisturizer, lip balm, ear plugs in a cute hard case, dental kit, and even cotton pads, q-tips and nail file. There's even a “Sleep Relax” kit with pulse point oil to alleviate stress, and pillow mist, although I didn't try these as I'm somewhat allergic to perfumes. 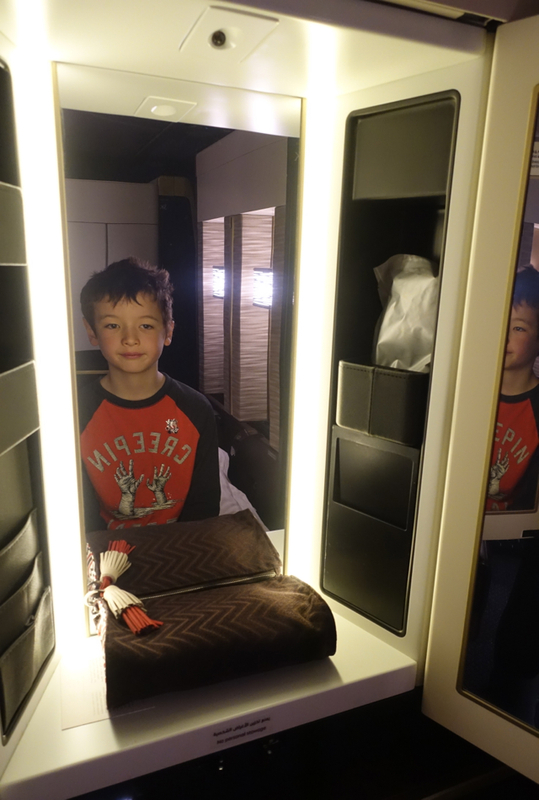 My son usually resists having a shower, but even he was amazed that he could have one on a plane. 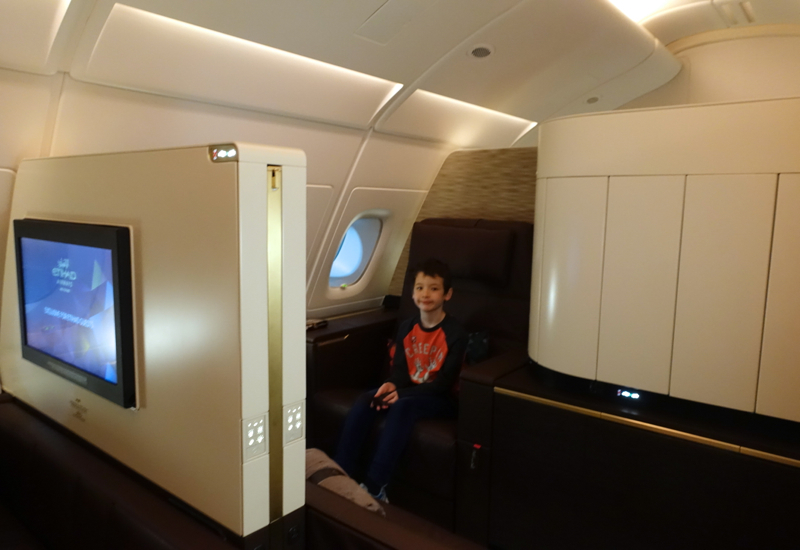 You can see his review of his experience at Kid's Review: Etihad First Class Apartment. It was a good thing he enjoyed his shower fairly early on in the flight, because later on, when I was ready to take a shower, the shower wasn't working and the crew was unable to get it working. 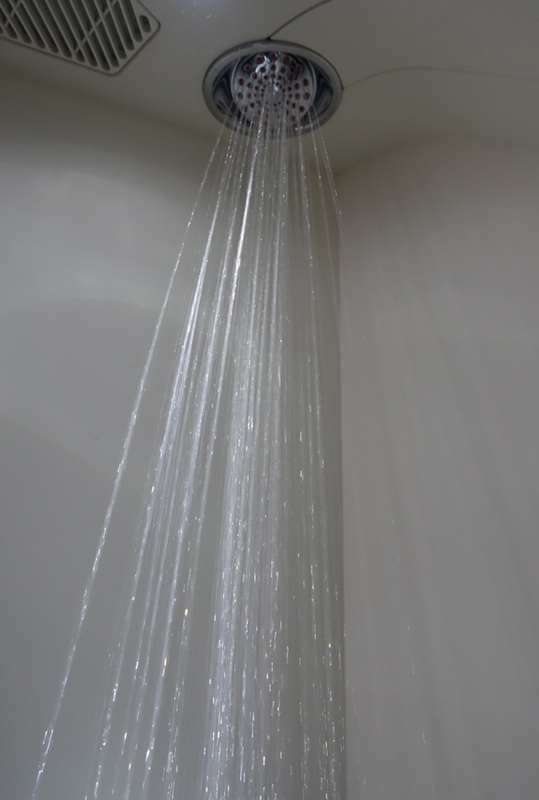 While I doubt this happens often, if a shower is important to you, you may want to request it for earlier in the flight. 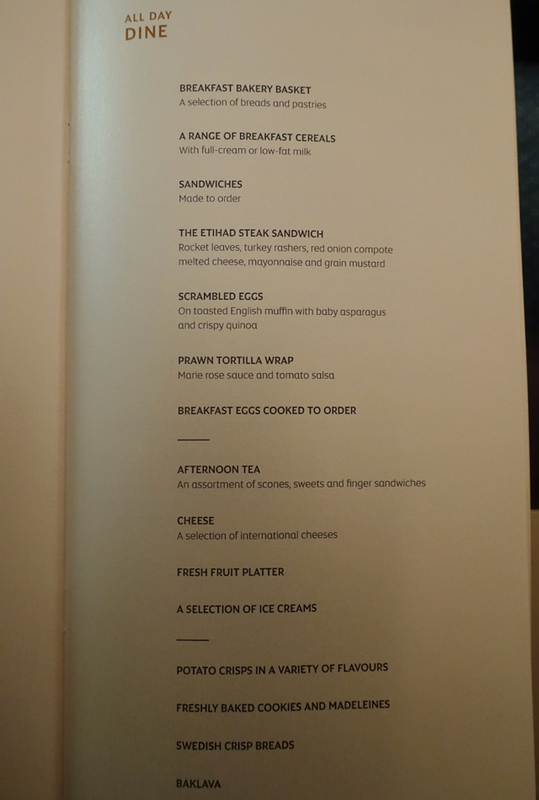 We were given menus, and while the same Grilled items, Etihad Steak Sandwich and Biryani are available on all Etihad First Class flights, at least the 4 I've been on, other appetizers, main dishes and desserts change. 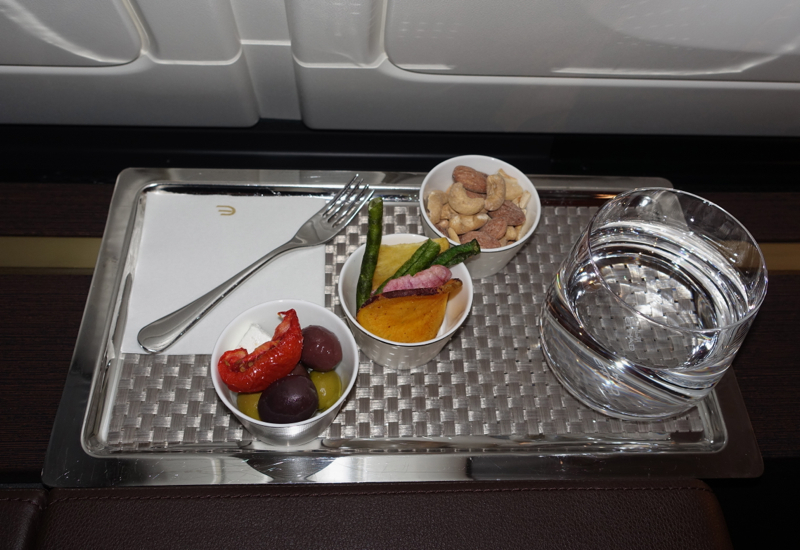 As on our Sydney to Abu Dhabi flight, we were first offered a tray of snacks: olives, vegetable chips and mixed nuts. 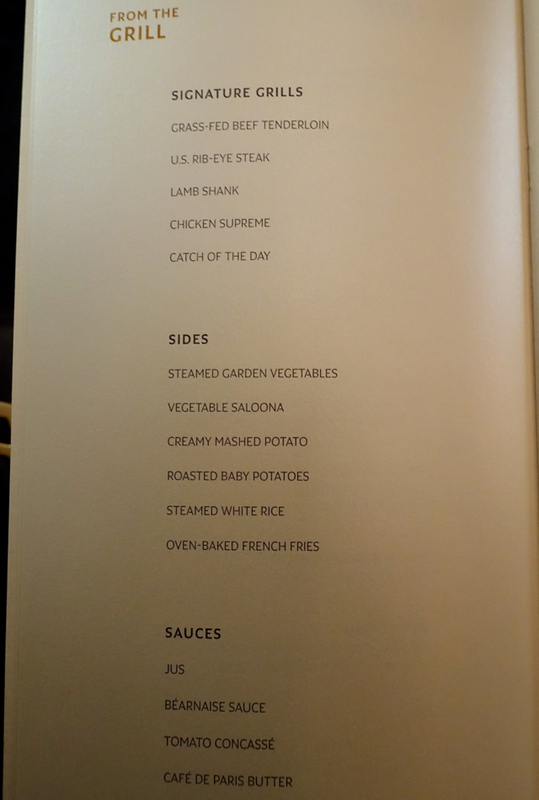 My favorite was the vegetable chips, since the nuts were served at room temperature and I'm not quite as big a fan of olives as my husband is. 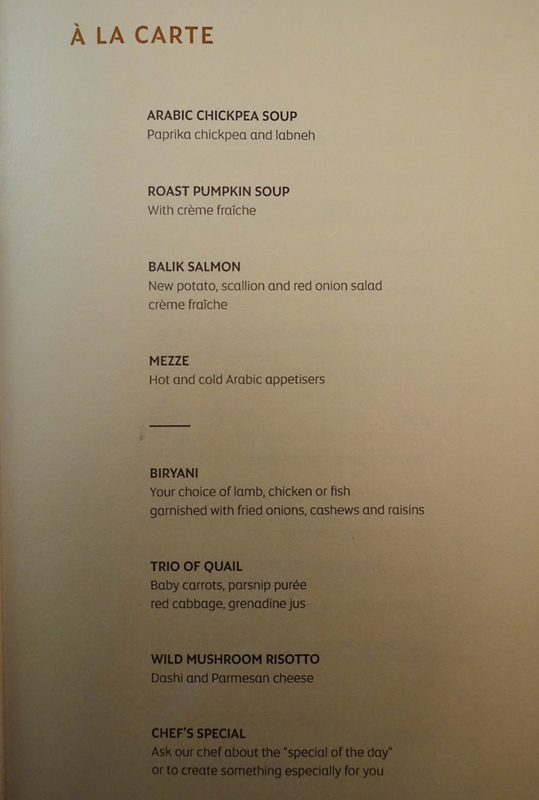 I was happy to see Balik Salmon as an appetizer on the menu, and we both chose it. 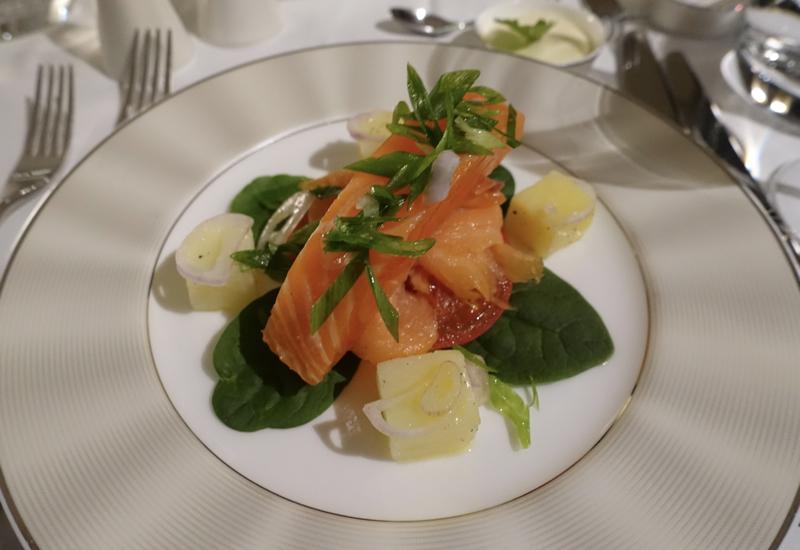 It was prettily plated and delicious, garnished with new potatoes and scallion, and with creme fraiche served on the side. 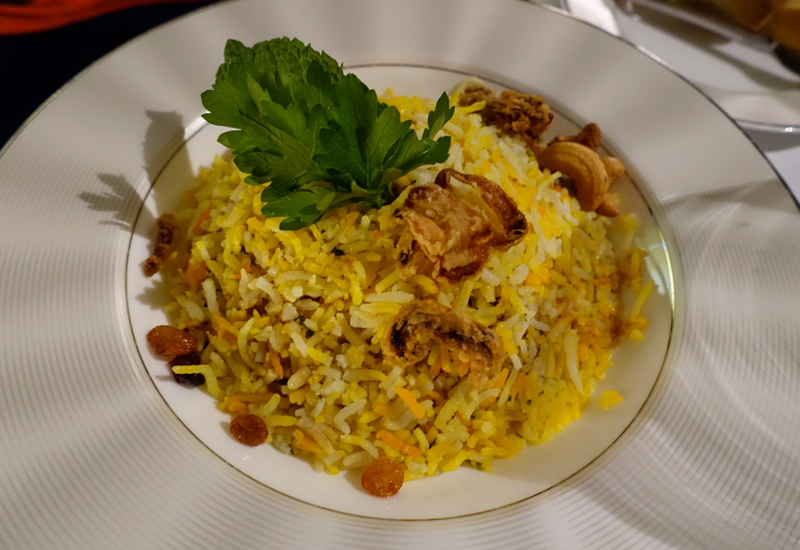 For mains, my son chose the Lamb Biryani to my surprise, since he doesn't often choose rice dishes. It was a very hearty serving, so he could barely eat half of it, but I stole a couple bites and the lamb was meltingly tender and excellent. 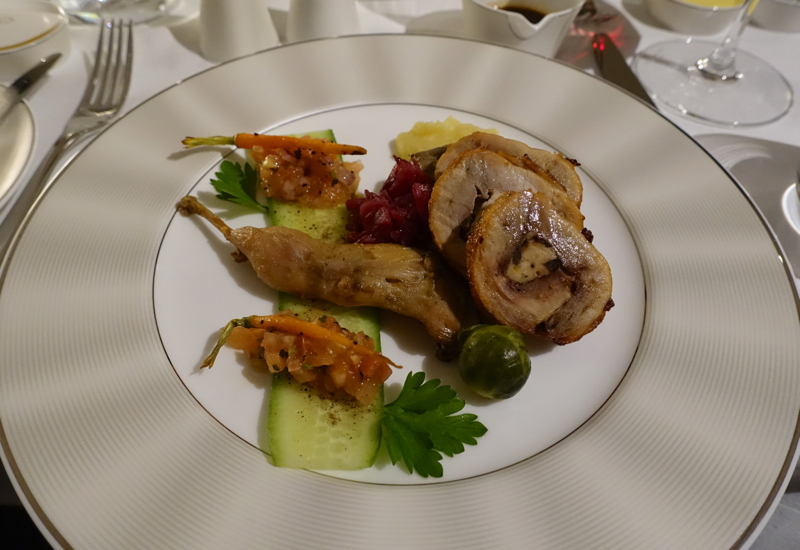 I couldn't have been happier with my Trio of Quail main dish–it's not common you see quail served even in first class, on a flight–and it was prepared perfectly, accented nicely with parsnip puree (again, not something you see often on a flight) and grenadine jus. 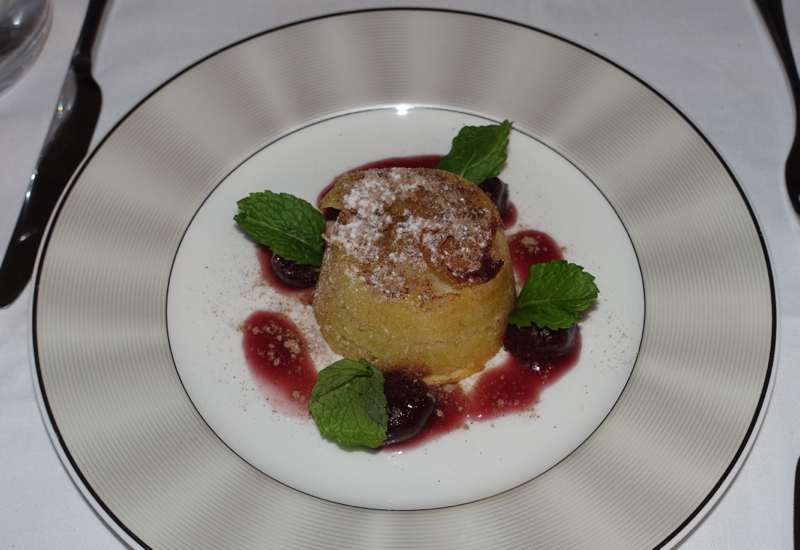 We shared a baked apple marzipan cake for dessert, and once again I was impressed with how delicious Etihad's best in-flight desserts can be. 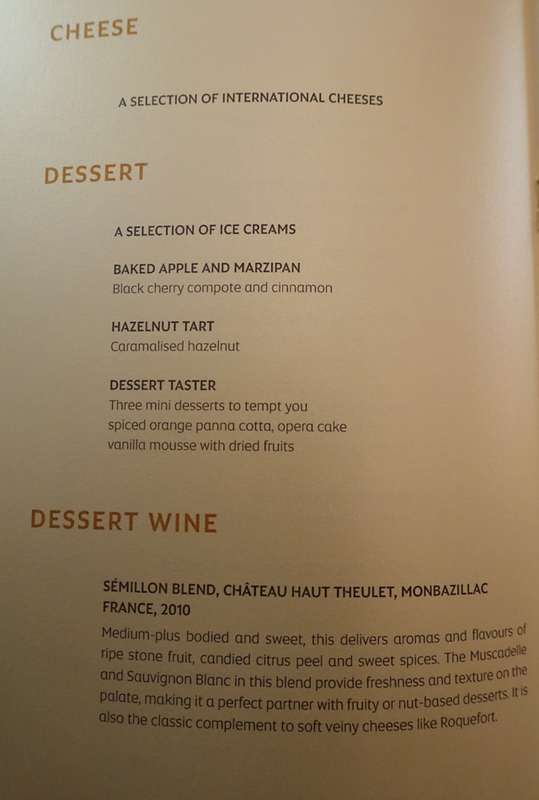 While the desserts I've had in Etihad lounges have ranged from mediocre to good, I've had several excellent desserts in Etihad First Class. Hours later, after we'd slept and I'd worked some, we had breakfast. 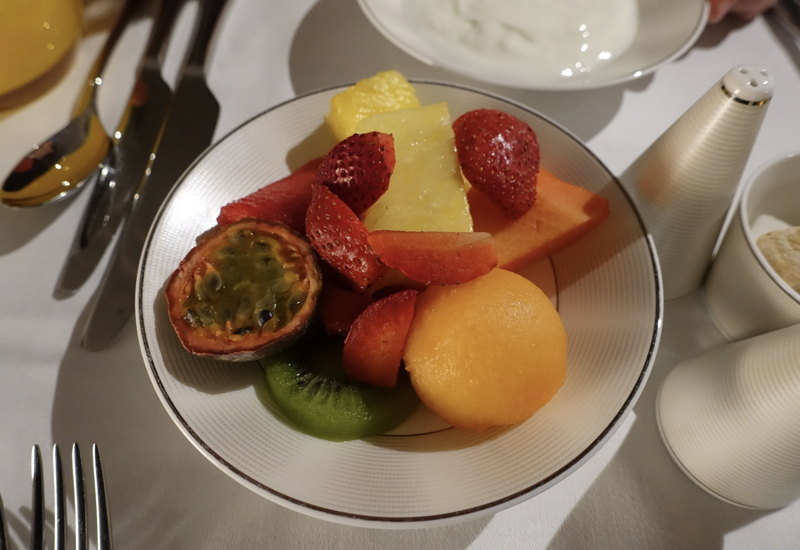 The fruit bowl included a nice surprise of fresh passion fruit. We also had plain Greek yogurt, mixed with a bit of Hero jam (as I've noted before, the jam could use improvement–a better brand such as d'arbo or agrimontana would be much nicer. 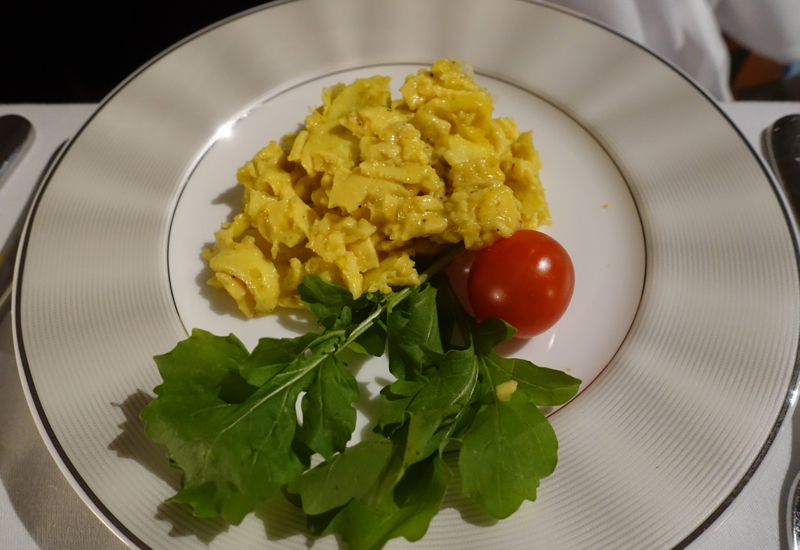 My son had some scrambled eggs, which were quite good, for in-flight eggs. 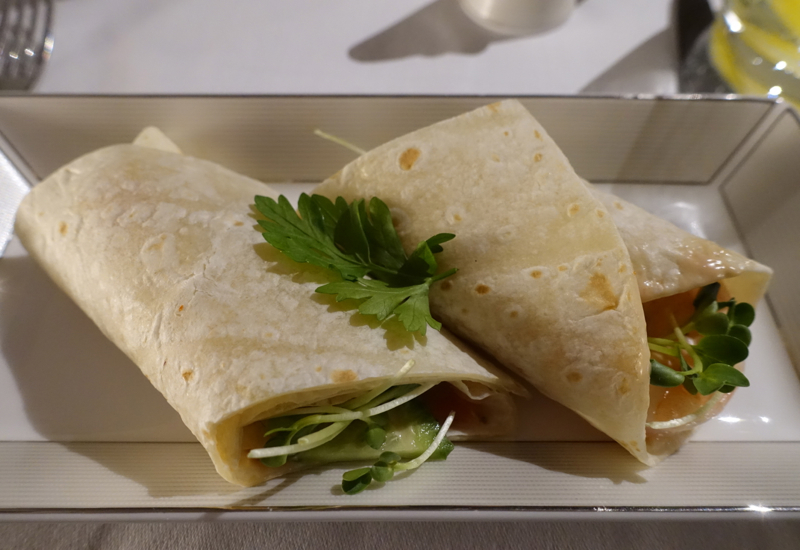 I can't recommend the Prawn Tortilla Wrap however–mostly plain room temperature tortilla, so I just ate the prawn part. After our dinner and while my son was having a shower, I asked one of the attendants to make our beds. 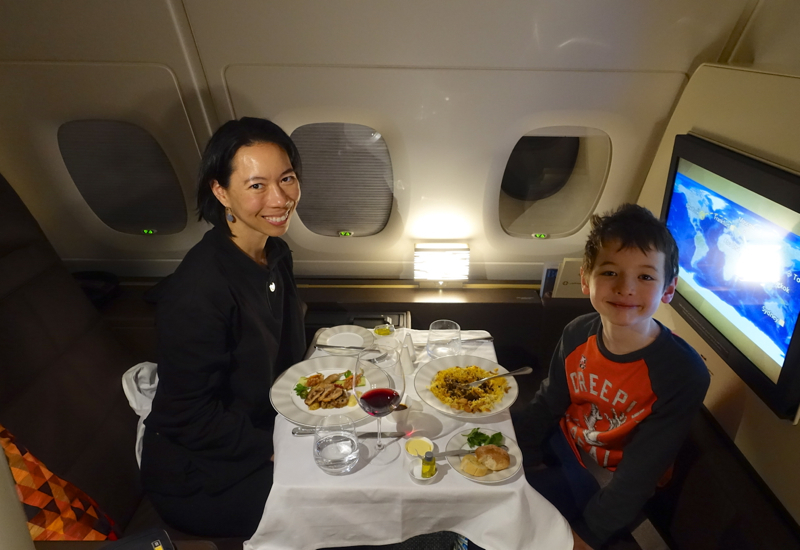 While my husband disliked having his head right near the aisle, that's the only way to be able to talk to your travel companion easily, and in our case, I wanted to read my son a bedtime story. 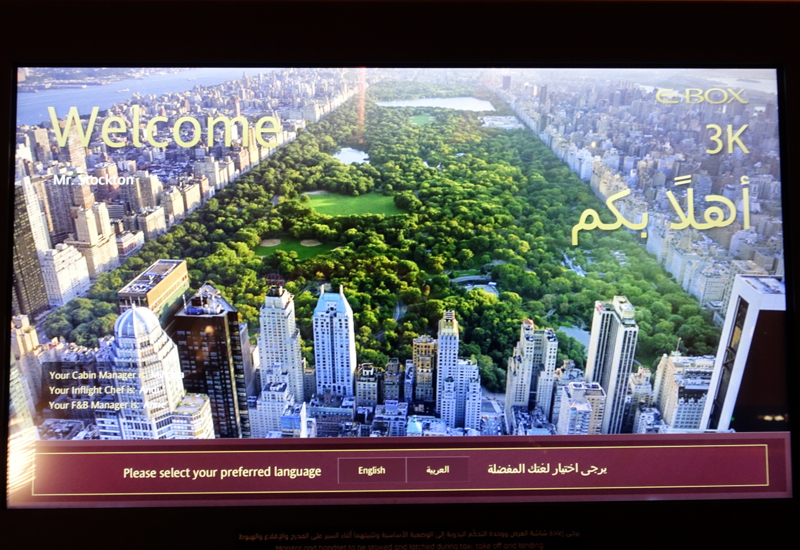 As good as our flight from Sydney to Abu Dhabi was, I liked our Abu Dhabi to New York flight even better, with the exception of the shower not working when I wanted to take one. 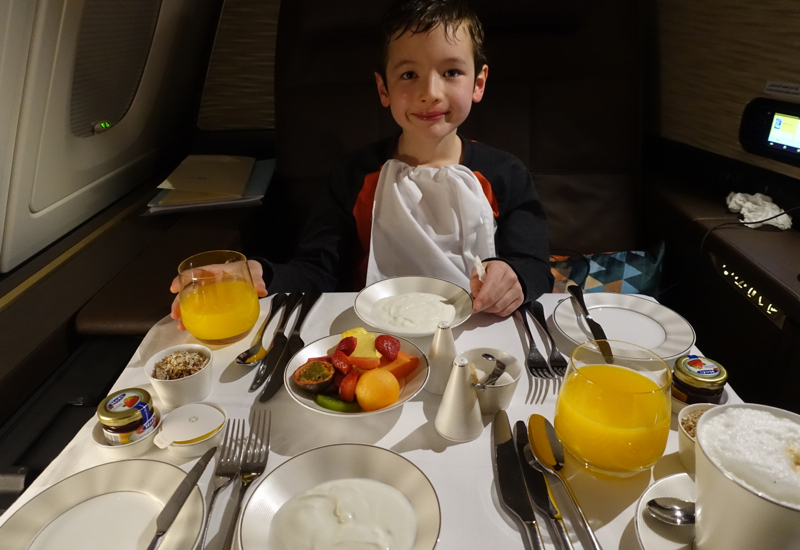 I thought the food was much better on this flight, and it also helped that we weren't quite so tired on this flight, having had half a night's sleep before going to the airport for this very early morning flight. 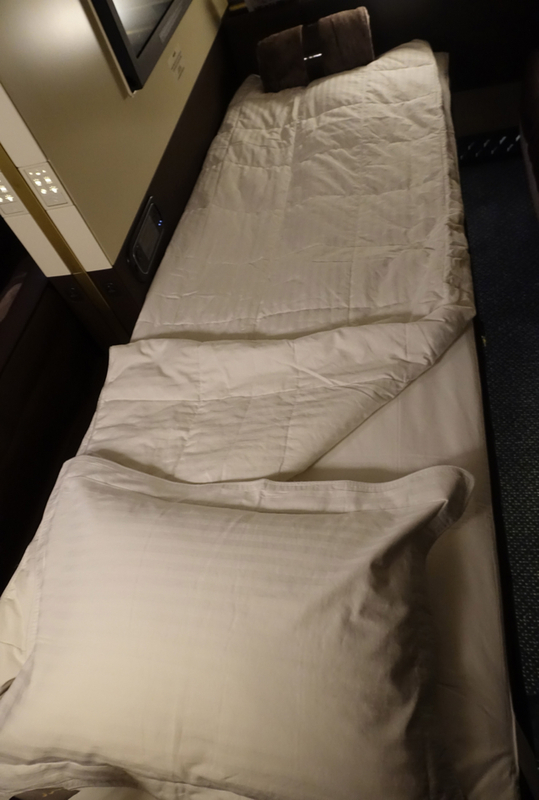 I will say that I still think Singapore Suites and JAL First Class have more comfortable beds; if Etihad could provide a thicker memory foam-like mattress pad I would rank it as the best first class product, but I can't do that without a more comfortable bed. 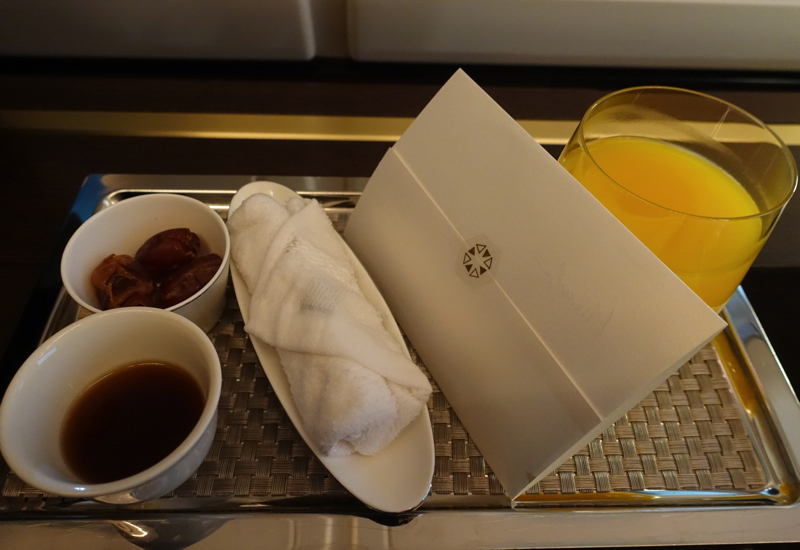 I even saw an Etihad Butler, Anne, whom I'd met previously at an Etihad event, so it was wonderful to see a familiar friendly face. 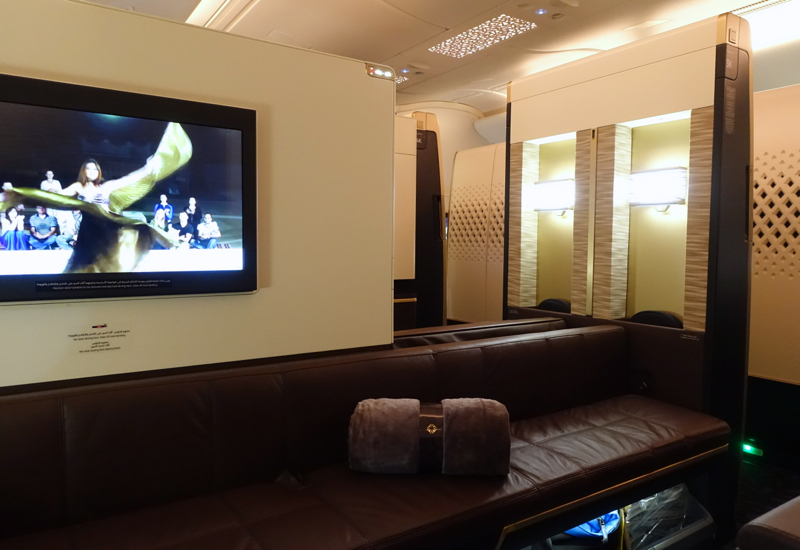 If you've flown Etihad First Apartment on the A380 between Abu Dhabi and New York JFK, what was your experience? Become a TravelSort Client and Book luxury hotels with Virtuoso or Four Seasons Preferred Partner Amenities!